3 lb. 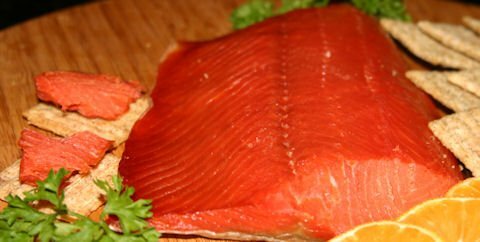 Alder Smoked Sockeye Salmon Package w/FedEx Delivery. At Captain Jack's Seafood Locker, we select the finest, locally harvested wild salmon, which we then fillet, hand trim, brine, and hot smoke to absolute perfection. Our Smoked Salmon Fillets are then vacuum sealed and blast frozen in approx. 1/3 lb. portions to preserve their rich flavor. Our Alder Smoked Sockeye is the perfect tasty gift for just about anyone and makes an instant appetizer sensation at your next party (don't forget to check out our delicious smoked salmon recipes too!). FedEx Priority Shipping is included! Additional fees apply for Hawaii delivery locations. You can earn 212 JACKpot Points! on this product!